A physician is someone who knows everything and does nothing. A surgeon is someone who does everything and knows nothing. A psychiatrist is someone who knows nothing and does nothing. A pathologist is someone who knows everything and does everything too late. A psychiatrist is a man who goes to the Folies-Bergère and looks at the audience. In Robert Andrews, The Columbia Dictionary of Quotations (1993), 747. I know each conversation with a psychiatrist in the morning made me want to hang myself because I knew I could not strangle him. In the training and in the exercise of medicine a remoteness abides between the field of neurology and that of mental health, psychiatry. It is sometimes blamed to prejudice on the part of the one side or the other. It is both more grave and less grave than that. It has a reasonable basis. It is rooted in the energy-mind problem. 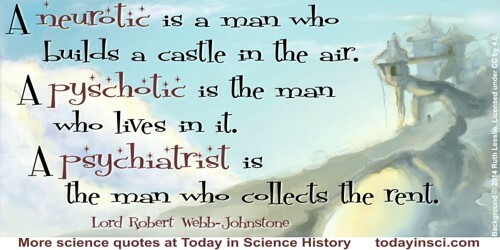 Physiology has not enough to offer about the brain in relation to the mind to lend the psychiatrist much help. In 'The Brain Collaborates With Psyche', Man On His Nature: The Gifford Lectures, Edinburgh 1937-8 (1940), 283. In John F. Briggs and David Peat, Seven Life Lessons of Chaos: Spiritual Wisdom from the Science of Change (1999, 2000), 29. A footnote gives the source of this idea as from David Shainberg, The Transforming Self: New Dimensions in Psychoanalytic Process (1973). Psychiatrist: A man who asks you a lot of expensive questions your wife asks you for nothing. From The Scientific Analysis of Personality (1965), 14. The invention of IQ did a great disservice to creativity in education. ... Individuality, personality, originality, are too precious to be meddled with by amateur psychiatrists whose patterns for a “wholesome personality” are inevitably their own. The psyche is distinctly more complicated and inaccessible than the body. It is, so to speak, the half of the world which comes into existence only when we become conscious of it. 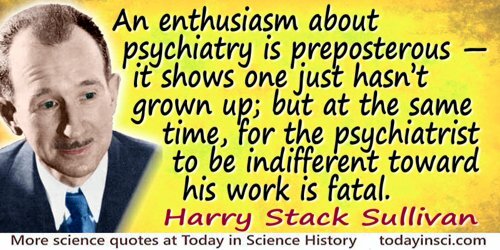 For that reason the psyche is not only a personal but a world problem, and the psychiatrist has to deal with an entire world. From Erinnerungen, Träume, Gedanken, as translated in Memories, Dreams, Reflections (1963), 132. The psychiatrist is the obstetrician of the mind. ~~[need primary source]~~ One of the most frightening things in the Western world and in this country in particular is the number of people who believe in things that are scientifically false. If someone tells me that the earth is less than 10000 years old in my opinion he should see a psychiatrist. As quoted, without citation, in Joan Konner, The Atheist’s Bible: An Illustrious Collection of Irreverent Thought (2007), 46. Webmaster is dubious about authenticity, and as yet, has been unable to find a reliable primary source - can you help?